Test Your Lineman IQ + Free Graphics - Ruralite Services, Inc. Most people know the nation’s 117,600 lineworkers are on call around the clock. But how heavy are their tools? What’s the record time set for rescuing a hurt man from the top of a pole? Did you know linework is so dangerous, lineworkers wear two sets of gloves to stay safe? Many utilities celebrate National Lineman/Lineworker Appreciation Day in April. We want to help! And while we love lineman sayings—my favorite is, “If you sent a lineman to the moon, there wouldn’t be a dark side,”—we decided to honor line heroes by sharing some little-known facts. We designed three fact-based lineworker graphics for utilities to share. Feel free to use one or all of these graphics when you celebrate your lineworkers on social media. Utilities in Ruralite’s Social Media Support Program receive these graphics, too. Subscribers also get a custom Facebook cover image featuring their local linemen and logo. Here’s an example made for our friends at Wells Rural Electric Company in Nevada. 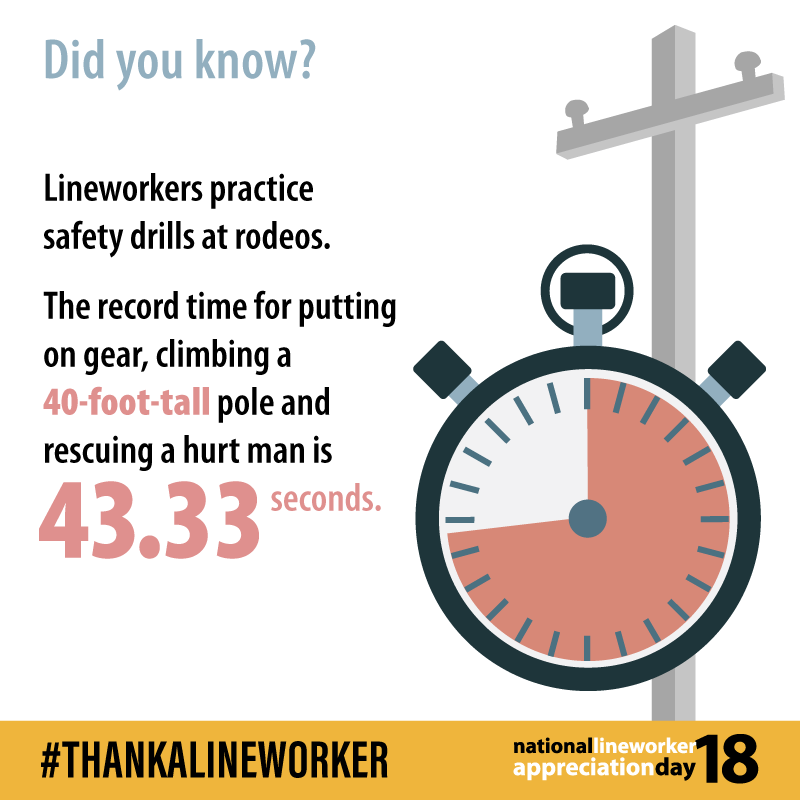 To include a growing number of women in the field, in 2018 the National Rural Electric Cooperative Association changed the name of the celebration to Lineworker Appreciation Day, creating the hashtag #ThankaLinewoker. To accommodate both utilities using this new language and utilities who want to stick with #ThankaLineman, we are providing two versions of each graphic: one with #ThankaLineman and another with #ThankaLineworker. The #ThankaLineman versions are above. Download alternate #ThankaLineworker versions of each graphic here: Rodeo, Water Bottle, and Gloves. April 9 Celebrated by many electric co-ops. Always falls on the second Monday of April, per a 2014 NRECA board resolution.